Before 1948, the American Heart Association (AHA) served as the professional society for physicians interested in cardiovascular medicine. Largely in response to a decision by the AHA to become a voluntary health organization dedicated primarily to cardiovascular research and public education, the American College of Cardiology (ACC) was founded on December 2, 1949, to focus on the needs of practicing cardiovascular specialists. In 1948, the newly formed National Heart Institute (now the National Heart, Lung, and Blood Institute) of the National Institutes of Health (NIH), was beginning to support and promote research on heart disease, which had become the nation's leading cause of death and disability. The founders of the College perceived the critical importance of bringing this new information to practicing cardiovascular specialists (including cardiovascular surgeons and pediatric cardiologists as well as adult cardiologists). 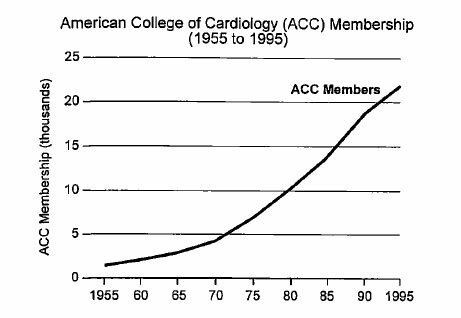 The growth of the ACC since 1949 has been dramatic, directly reflecting the increased number of cardiovascular specialists (Fig. 1). The College has conferred fellowship on approximately 85% of American Board of Internal Medicine (ABIM)-certified cardiologists in the U.S. and a significant number of pediatric cardiologists and cardiac surgeons. The College currently has 25,214 members in the following categories: 34 Masters; 20,525 Fellows; 1,224 associate fellows; 556 members; 1,110 affiliates; and 1,765 affiliates in training. Cardiovascular specialists are widely distributed throughout the U.S., ensuring that American patients receive the best cardiovascular care in the world. Figure 1: Total number of ACC members, including Fellows, Associate Fellows, Affiliates, and Affiliates-in-Training; includes 2,500 non-U.S. members. From the College's beginning, its major focus has been on continuing medical education (CME). This concentration has evolved to make the ACC's CME program one of the most comprehensive of the world's medical societies. In the process, the College became the world's beacon for the teaching of cardiovascular medicine. As early as the 1970s, as health care costs began to rise and health care reform became an issue for both the federal government and employers who provide private health insurance, advocacy was progressively becoming a more important function of the College. The overriding purpose of the College's advocacy efforts has been to preserve access to the highest-quality care for patients with cardiovascular disease. The College has garnered great credibility and experienced widespread success in its dealings with the various forces of health care system reform. Figure 2: Annual decline in age-adjusted mortality from coronary heart disease, stroke, and high blood pressure. 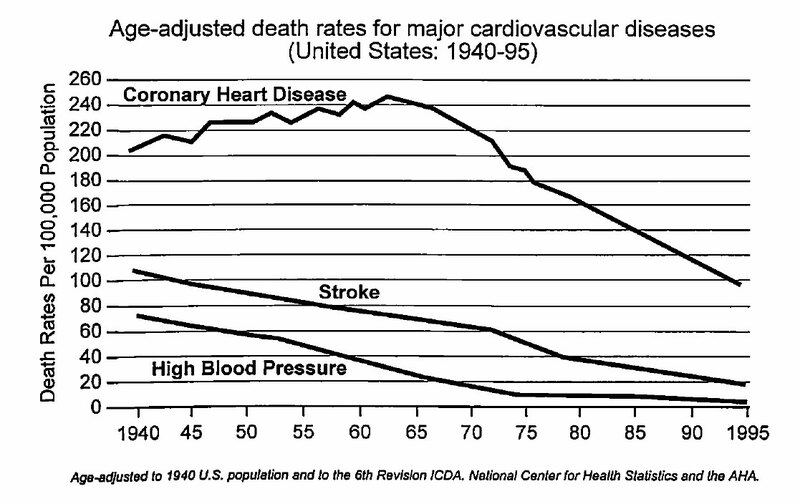 Note the increase in coronary heart disease deaths until 1965 followed by a dramatic and steady decline. The growth and expansion of the ACC has been concurrent with the remarkable progress over the past 50 years in the diagnosis and management of patients with cardiovascular disease. Since the mid-1960s, improved public health measures in combination with better medical care (resulting from enormous research efforts) have reduced age-adjusted mortality from cardiovascular disease by nearly 50% (Fig. 2). Notably, this decline is associated with an increase in the number of ACC members during that time frame. The College has played a crucial role in bringing the fruits of research into daily clinical practice. The decline in age-adjusted mortality from cardiovascular disease does not mean that heart disease has been eliminated as the major cause of death in the U.S. To the contrary, the absolute number of deaths from cardiovascular disease has again begun to rise as patients who have survived 15 additional years with heart disease are beginning to expire. Compounding this problem is the large baby boom population, whose aging will soon dramatically increase the prevalence of cardiovascular disease and cause at least a twofold increase in prevalence by the 2020s. The need for cardiovascular specialists will, therefore, grow during the next 25 years. Currently, cardiovascular medicine (including hypertension and vascular disease) accounts for nearly one fifth of health care expenditures, and the projected increase in the prevalence of heart disease will have major economic consequences. The College will continue to play a major role in solving this problem, especially the projected shortfall of cardiovascular specialists in the next century. The College's CME mission has been achieved by an enormous variety of educational programs. The Annual Scientific Session was the College's earliest approach to CME. In addition to presentations of the latest research (2,300 abstracts in 1999), more than 200 state-of-the-art symposia and interactive teaching sessions provide effective forums for promoting improvements in patient care. The important role of new technology in cardiovascular care has led to the development of one of the most extensive exhibits of cardiovascular devices and products in the world; more than 400 exhibitors have participated in recent Annual Scientific Session Expositions. Because of its diverse and comprehensive educational offerings, including recent spotlight symposia in interventional cardiology (ACCIS 1999 and 2000), clinical cardiology (ClinCard 2000), and echocardiography (Echo 2000), the Annual Scientific Session attracts more than 30,000 participants. The College also sponsors or co-sponsors regional extramural educational programs (36 in 1999) dealing with a wide spectrum of topics, and the opening in 1977 of Heart House, ACC headquarters in Bethesda, Maryland, with its state-of-the-art Learning Center, has allowed small-group, interactive programs (25 in 1999) from which videotapes and teleconferences have been produced. The ACC's audiotape journal, American College of Cardiology Extended Learning (ACCEL), now has approximately 7,000 subscribers and has become the most successful product of its type in the world. ACCEL provides a unique form of education wherein experts discuss new research and answer questions about its clinical application in an informal format and wherein subscribers can listen as their schedules permit. ACCEL provides a user-friendly link between academia and clinical practice. 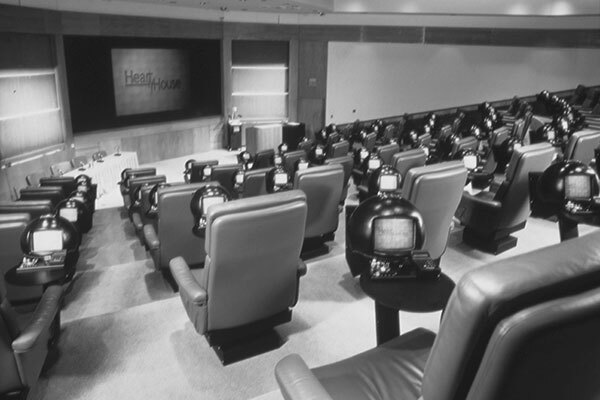 In the 1970s, Heart House Television, an in-house video production facility, was installed at Heart House through a grant from the Simon and Jacqueline Dack Endowment. Numerous videotapes produced by Heart House Television have covered new cardiovascular technologies and played an important role in the incorporation of these technologies into clinical practice. Renamed Heart House Digital, the facility has since expanded to develop multimedia products. 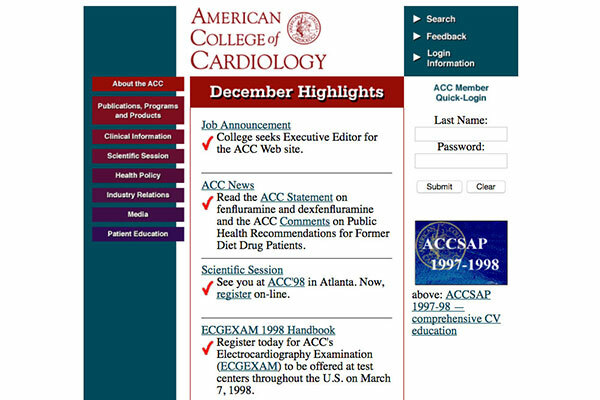 The first Adult Clinical Cardiology Self-Assessment Program (ACCSAP) was released in 1993. It consisted of state-of-the-art reviews of the full spectrum of cardiovascular medicine combined with multiple-choice questions (whose answers were both provided and explained). The ACCSAP subsequently adopted the CD-ROM format and has won several national multimedia awards. In addition to biennial editions of the ACCSAP, the College has produced self-assessment programs in pediatric cardiology, echocardiography, electrocardiography, electrophysiology, and interventional cardiology. These products have been distributed internationally, and ACCSAP has been translated into four languages, making it one of the world's most successful CME programs. The College's Web site (http://www.acc.org) was established in 1997. Over time, it is likely to supplant some of the older educational technologies and become a major source of CME for ACC members. The Web site, already a repository for information about the College's activities and a tool for Annual Scientific Session online registration, itinerary planning, and abstract review, will deliver the next generation of educational offerings—"just-in-time" and customized CME. The College's flagship publication, the Journal of the American College of Cardiology (JACC), is the premier peer-reviewed journal for practicing cardiovascular specialists worldwide. The journal's online presence really took off in 1995 and greatly expanded two years later. It has become a major component of the cooperative ACC-Elsevier Science Inc. product, CardioSource™. As part of its role in advancing cardiovascular science, the College has always promoted clinical research. Each year, it advocates for the budget of the National Heart, Lung, and Blood Institute. The College's reasoned testimony before the Congress has helped to ensure continued growth in the NIH budget over the past several decades, thereby helping the U.S. to maintain its place as the leading scientific community in the world. Each year, the College honors a distinguished scientist at the Annual Convocation Ceremony. In addition, since 1981, the College has given 102 ACC/Merck Adult Cardiology Research Fellowship Awards. A recent survey has indicated that half of the ACC/Merck awardees are still active academicians. These awards, as well as the recently begun ACC Career Development Awards, and the Young Investigator Awards (which are nearly 40 years old), have stimulated and encouraged young scientists to pursue careers in research. Another program for the promotion of research is the joint ACC/European Society of Cardiology (ESC) Academic Exchange Program, which enables young scientists to visit laboratories in Europe and the U.S. In 1980, the College made a pivotal decision to develop clinical practice guidelines. The development of these important documents became a joint effort with the AHA. The purpose of the guidelines is to provide an authoritative educational tool for clinicians. Research information forms the core of the guidelines, but consensus among experienced clinicians provides important support for the guidelines when research does not yet indicate clear-cut recommendations. The guidelines also serve to "define the universe" by indicating what should be done (class I) and what should not be done (class III) and by designating areas that are still uncertain (class II). The rigorous scientific approach and unbiased nature of these guidelines has resulted in their widespread acceptance and respect. Initially, the guidelines addressed the multiple technologies comprising cardiovascular medicine. More recently, they have focused on evaluation and management of major disease categories, such as acute myocardial infarction, valvular heart disease, and angina pectoris. The College now updates guidelines regularly, allowing them to evolve as research results become available. In the future, clinical data from practice, such as those obtained by the ACC-National Cardiovascular Data Registry™ (ACC-NCDR™, will be available to the writing groups preparing guidelines. Thus, research results will be enhanced by actual practice experience, furthering the validity of the guidelines. In turn, this information will be incorporated into the College's CME offerings. As reform of the health care system unfolds, the ACC/AHA clinical practice guidelines are proving to be one of the core assets of the College. The College's founders recognized that only well-trained specialists can provide the optimal care needed by patients with cardiovascular disease. Thus, the decision to require ABIM certification in cardiovascular diseases as a requirement for ACC fellowship was a signal decision. This decision stimulated steady improvements in the clinical training of cardiologists, largely implemented by the College's Training Directors Committee. In 1985, a Bethesda Conference on Adult Cardiovascular Training proposed the first formal training guidelines for adult cardiology. These recommendations subsequently became the basis for the accreditation of cardiovascular training programs by the Accreditation Council on Graduate Medical Education (ACGME) and for acceptance into the ABIM examination process. These recommendations were further refined in 1994 when the ACC published the Core Cardiology Training Symposium (COCATS). The Core Cardiology Training Symposium II is currently in development, and other training guidelines for subspecialty disciplines have also been developed. The College first explored work-force needs in its ninth Bethesda Conference in 1975. Further refinements of the issue occurred in 1985 and 1993 with the nineteenth and twenty-fifth Bethesda Conferences, respectively. The delineation of appropriate work-force needs has become extremely important in the 1990s because the private sector perceives that the U.S. has an excess of cardiovascular specialists. Indeed, the number of new trainees in cardiology has declined since its peak in the mid-1980s. By stressing the added value to medical care provided by cardiovascular specialists (strongly supported by recent outcome data), the College has played a major role in the gradual acceptance of the value of specialty care by managed care organizations and insurers. Nonetheless, work-force size and composition remain key areas of interest and advocacy for the College. The College has always supported cardiovascular trainees (i.e., its Affiliates-in-Training members) by providing complimentary subscriptions to JACC and ACCEL; a job placement database; career guidance; and ABIM examination preparation tools, such as Board Review courses and self-assessment programs (e.g., ACCSAP). Recently, courses in nonclinical topics, such as quality measurement, practice management, and health care system leadership, have been developed. The W. Proctor Harvey Young Teacher Awards were established in 1997 in association with the W. Proctor Harvey Foundation to support two young medical school teaching faculty each year. The guidelines have been supplemented by several expert consensus and position statements for emerging technologies and practices; training and competency statements to guide training programs and physicians in practice; and occasional clinical alerts, which the College releases in response to issues that require immediate attention. By the 1970s, health care system reform was underway in the U.S., and one result of these efforts was encroachment on the autonomy of cardiovascular specialists. To combat this trend and its potential to endanger patients, the College dramatically increased the scope of its advocacy activities. Indeed, such activity was a major factor in the relocation of the College's headquarters to the Washington, D.C., area in 1965. An initial approach was the formation of the ACC Government Relations Committee and the development of a professional staff to facilitate direct interaction with Congress; the Health Care Financing Administration (HCFA); the American Medical Association (AMA); and, more recently, state governments, whose ACC contacts are largely through the College's chapters. A substantial (and successful) effort has been devoted to working with HCFA on the refinement of the work components of the Medicare Resource-Based Relative Value Scale (RBRVS) through membership on the Relative Value Update Committee. The College's "seat" on the AMA CPT (Current Procedural Terminology) Committee has been crucial to the introduction of new cardiovascular procedures to the reimbursement process. The College has participated in numerous coalitions with other medical professional societies, for example, t~ advocate for access to specialty care and for the Patients' Bill of Rights and to oppose the inappropriate fraud and abuse policy of the HCFA and the HCFA's 1998 RBRVS practice expense reduction proposals. This latter process is still a work in progress, but the College has succeeded in substantially mitigating the proposed reduction of practice expense reimbursement to cardiovascular specialists. In 1991, the College led a coalition to restore payment for interpretation of electrocardiograms, which had been terminated by an act of Congress. Because of the complex nature and fragmentation of the private-sector health care system (insurance, managed care, and industry), advocacy efforts with the private sector have been less successful than those with the federal and state governments. However, inroads are being achieved by several state chapters, and further interaction with the private sector is a major ACC goal for the next century. Another frontier for the College's advocacy efforts is direct communication with patients and their caregivers, who are, in fact, the strongest advocates for high-quality cardiovascular care. These communications will be greatly enhanced by the proliferation of Internet technologies, and plans are underway to develop this approach. As part of the ACC's fiftieth anniversary commemorative program, the College published a patient booklet that describes the progress that has been made in conquering heart disease since 1949. This booklet has been lauded as a unique and useful tool to assist cardiovascular specialists in explaining heart disease treatment and prevention strategies to their patients. The College works regularly with the Food and Drug Administration (FDA) and has been responsible for many improvements in the FDA approval process; ACC input has been especially helpful as the FDA has attempted to deal with the striking complexity of cardiovascular technology. Likewise, by working with the Nuclear Regulatory Commission, the College has achieved modification of nuclear licensing rules to make them more appropriate for cardiovascular specialists. The College supports a number of entities helping to create high standards for the cardiovascular laboratories used by ACC members. In conjunction with the American College of Physicians-American Society of Internal Medicine and the AHA, the College is developing clinical competence statements that define the skills and training recommended to perform cardiovascular procedures. Statements, like others the College has collaborated on, will prove to be important in assisting members to obtain credentials at their local institutions. In the early 1990s, the College developed the ECGEXAM, a competence examination for the interpretation of electrocardiograms. The ECGEXAM was so successful and widely accepted that the College transferred the rights to the examination to the Institute for Clinical Evaluation, a component of the ABIM, in 1998, when the College made a strategic decision to focus on the development of educational tools. The ECGEXAM continues to help ensure the high quality of electrocardiographic interpretation in the U.S., over haft of which is performed by generalist physicians. A perception that care provided by specialists is more costly than that provided by primary care physicians led to the establishment of the ACC Economics of Health Care Delivery Committee. For the past decade, this committee has analyzed the Medicare database (the largest national database available) to determine the trends in cardiovascular specialists' activities. This information has provided extremely important background information for many of the College's advocacy activities. In 1997, the College held an "Economics Summit" whose participants included representatives from various disciplines in health care system economics. This meeting highlighted the remarkable (and unexpected) cost-effectiveness of most cardiovascular therapies, including those associated with expensive technology. The College launched the aforementioned ACC-National Cardiovascular Data Registry™ operation in 1999 with the goal of obtaining clinical data from members to help define optimal and appropriate clinical care. The registry has been an enormous and complex undertaking and is still evolving. To date, the registry has already enrolled 225 hospitals and collected data from more than 100,000 patient records. Essential to the evolution of the database was the creation of standardized data elements, which was accomplished by a College task force in 1998. Also, in 1998, the College's investment in the NCDR™ was reaffirmed to oversee collection and analysis of data. At present, the NCDR™ is moving from a focus on procedural outcomes toward a disease-oriented, longitudinal approach. Collecting and analyzing information in medicine is a time-consuming and arduous process, but the College will eventually reap numerous benefits from having developed the NCDR™. Perhaps one of the most significant achievements of the College was its leadership in working with industry and other professional societies to establish international standards for digital imaging (DICOM). This standard allows cardiovascular laboratories throughout the world to exchange digital images readily—an essential feature in the modern world. The Corporate Liaison Board was established in the 1990s to formalize the ACC's important and long-standing working relationships with the pharmaceutical and device industries. The common thread of improving cardiovascular care was the basis for this structured relationship, particularly as more and more clinical research and education are supported by industry. Since 1965, the College has held 31 Bethesda Conferences, which have dealt with important emerging topics (e.g., prehospital coronary care, preventive cardiology) as well as topics for which little scientific data exist (e.g., use of practice guidelines, insurability, eligibility for athletics, air crew fitness). Two of the more important Bethesda Conferences tackled issues in medical ethics. These conferences provided a crucial component of the ACC's effort to promote quality care. Ethical issues have become increasingly important and complex as health care system reform proceeds. One recent Bethesda Conference addressed the major problems facing divisions of cardiology in academic medical centers, the backbone of medical teaching and research. The College will continue to identify important issues and trends and present them in this unique multidisciplinary format. The state of worldwide cardiovascular care has been a concern of the College for many years. The early "Circuit Courses" held in less developed countries enabled U.S. cardiovascular specialists to interact face to face with cardiovascular specialists in these countries and established a favorable international reputation for the College. As the economic well-being of the world improved, more cardiovascular specialists and more cardiovascular research have developed outside of the U.S. Currently, nearly one haft of the research presentations at the College's Annual Scientific Sessions are from international participants, and one half of the physician attendees are from abroad. The JACC submissions reflect the same trend. The College has a number of formal relationships with other professional societies (e.g., the ESC, the Canadian Cardiovascular Society, the World Heart Federation). International Fellows play an extremely important role in promoting the mission of the College by assisting and supporting the distribution of ACC educational products throughout the world. As cardiovascular disease has become the top public health problem in the world, the College's role as the major world professional society will only increase. The College depends on the voluntary teaching efforts and leadership of its members. These efforts have been remarkably forthcoming during the past 50 years. The College provides a place and many opportunities for high-minded professionals who share the common goal of improving the quality of cardiovascular care to meet and collaborate. The related esprit de corps and trust in the College is its major asset. The leadership of the ACC has traditionally been composed of both academicians and practitioners, and the interaction between the two has helped each to understand the other's role. The ACC Board of Governors has assumed an increasingly important role as the direct link between national goals and the needs of the membership. Increasingly, chapters deal with health care reform at the state and local levels. The chapters also provide an opportunity for young members to become involved with the College and, as such, are an important source of future College leaders. The bulk of the College's activities are performed by more than 50 standing committees and several task forces formed to deal with specific issues. The pivotal role of the outstanding ACC staff is most obvious in the high level of performance of the College's committees. The Board of Trustees is ultimately responsible for steering the College through the present and planning the College's future. The trustees meet three times each year, and their deliberations have had a major impact on the development of ACC policies and programs. The ACC officers and executive staff comprise the College's Executive Committee, which serves to organize and focus the work of the trustees. In 1998, the ACC Strategic Plan was approved. Currently, several task forces are working to implement the goals outlined in the plan. At the forefront of this effort is the Task Force for the Twenty-first Century, which is coordinating efforts to look at governance, priority setting, responsiveness to membership needs, educational approaches, and fiscal performance. Efficient management, effective CME and advocacy efforts, and, perhaps most important, the fact that it is a member-driven association make the College one of the world's most widely admired medical professional societies. Unique among major societies, the executive vice president of the College is not a physician. Throughout its history, the College has been fortunate to have had a visionary executive staff who have effectively implemented the goals set by physician leaders. Good fiscal health has enabled the College to achieve the successes of the past 50 years. As the ACC embarks on its second half-century, its leadership is diligently working to ensure its financial viability for the future. The increasing need for advocacy efforts and the need to retool in order to provide expanded online services and education are just two areas that the ACC is examining in relation to available resources and ongoing priorities. The ACC Task Force for the Twenty-first Century, along with the Board of Trustees, is leading this effort so that the ACC will continue to be a valuable resource for cardiovascular specialists well into the new century. As the scope of cardiovascular medicine has expanded and knowledge and technologies have grown dramatically over the past 50 years, the cardiovascular specialty has become progressively more subspecialized. This change has led to the development of subspecialty societies, which are listed in Table 1. To maintain a strong and unified voice for the "House of Cardiology," the College regularly convenes meetings with the leadership of these societies to pursue common educational and advocacy goals. The role of the College as the umbrella organization for cardiovascular specialists cannot be understated in the uncertain climate of increasing health care system reform. The ACC has been a major force in the improvement of the quality of care for cardiovascular patients for the past 50 years. It is a well-managed, powerful, idealistic, and forward-looking professional society that is positioned to provide its members with the tools to respond to the exciting and daunting challenges of the twenty-first century. The author is grateful for the assistance of Mr. William Nelligan, Mr. David Feild, Dr. Sylvan Weinberg, Dr. W. Bruce Fye, and various ACC staff in the preparation of the manuscript for this article. This article was originally published in JACC, Volume 35, Issue 4, March 2000. 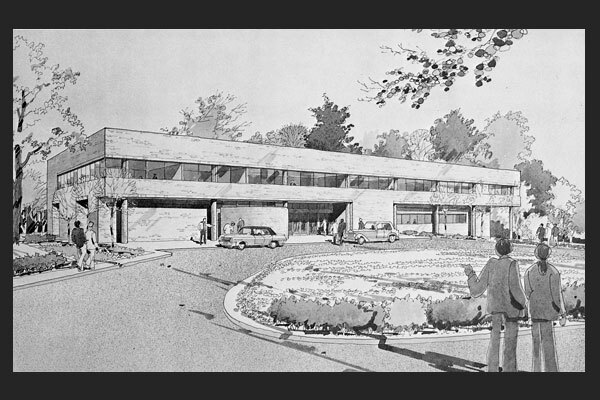 Lewis R. The ACC at 50: a giant grew in Bethesda: The impact of the ACC on cardiovascular medicine. J Am Coll Cardiol. 2000;35(4):1061-1066. doi:10.1016/S0735-1097(00)00560-X. An architectural drawing of the original Heart House, in Bethesda, Maryland. 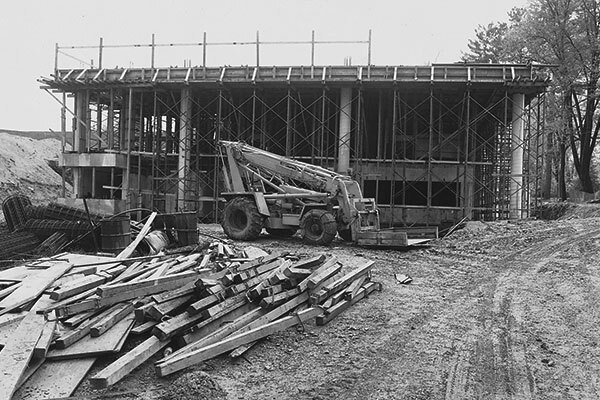 Construction of the original Heart House, in Bethesda, Maryland. The original Heart House's Learning Center was a forerunner in multimedia communication aids. Each chair was a "mini-learning center," housing a TV monitor, multiple-choice response system, stethophone, palpator, call light, and tape recorder jack. 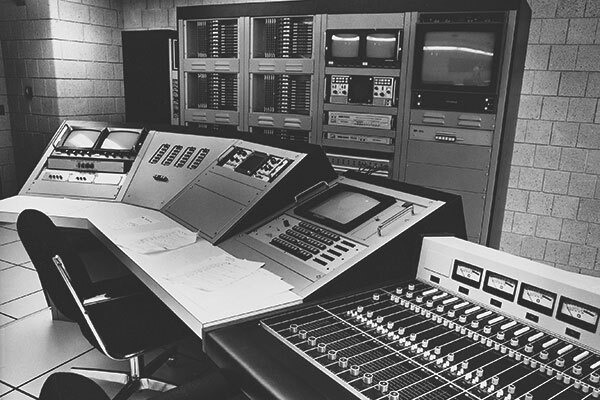 The original Heart House's "Heart House Television" studio, which was initially used to produce content for the Learning Center and later for broadcast and teleconference production. 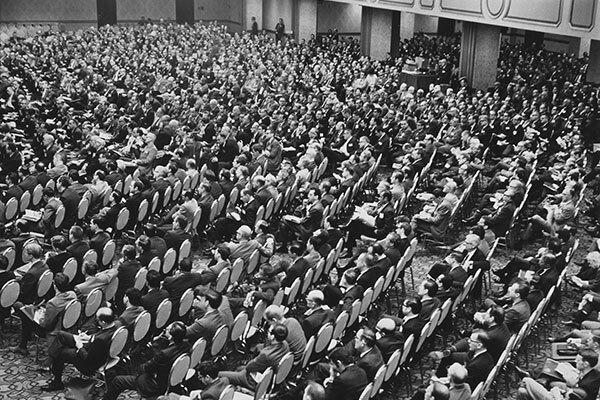 An ACC regional meeting in New York City in 1957, which was attended by 2,500 physicians. 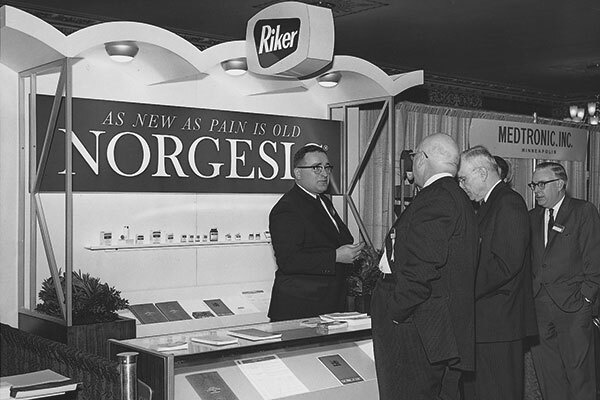 An exhibit at ACC's Annual Scientific Session in 1965. 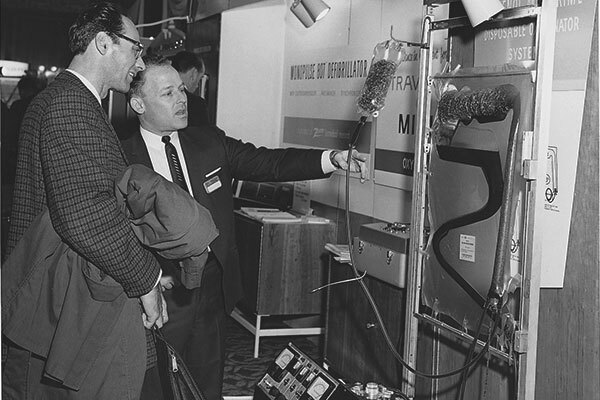 An exhibit at ACC's Annual Scientific Session in 1965. Transactions of the American College of Cardiology (left), which contained papers presented at the previous national meeting. 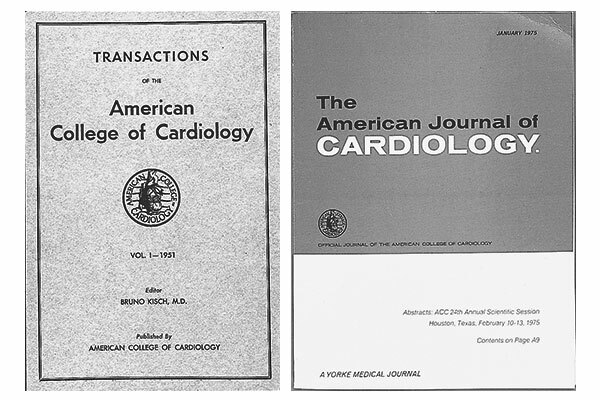 The American Journal of Cardiology (right), which launched in 1958, was a clinical research journal dedicated to practicing clinicians and cardiologists. 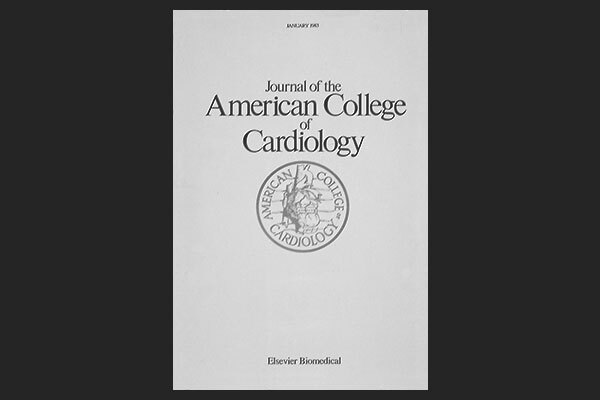 The Journal of the American College of Cardiology (JACC) was launched in 1983, replacing the American Journal of Cardiology. 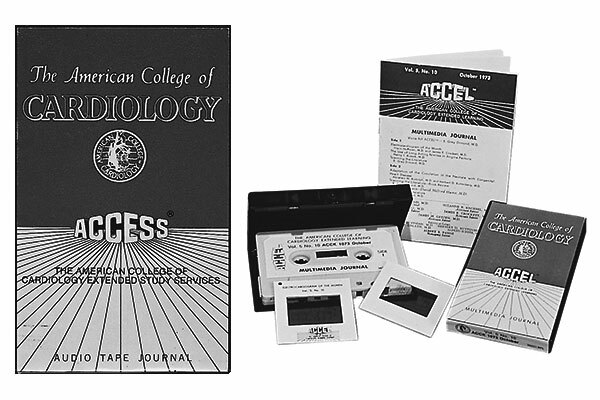 American College of Cardiology Extended Study Services (ACCESS), an audio cassette journal, was launched in 1969. The product was renamed ACCEL (American College of Cardiology Extended Learning) in 1972. 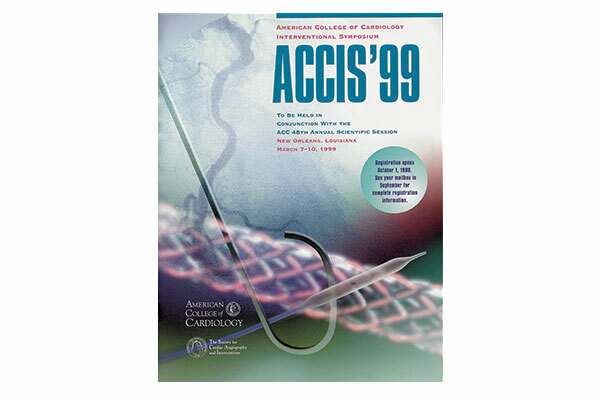 ACCIS'99, the ACC Interventional Symposium held at ACC's Annual Scientific Session in 1999. The original ACC.org was launched in 1996.